Sage Northcutt is the human Ken doll who can cage fight – but right now, the former child actor and karate prodigy doesn’t have a contract. 'Super' Sage, still just 22, has been dumped by the UFC despite once being touted personally by Dana White as a future superstar. Also, despite being on a three-fight winning streak. It is a remarkable fall from grace for the All-American golden boy. “His contract was up, so we let him go,” White said on UFC Unfiltered. The timing was surprising. Northcutt was the third-youngest fighter to compete in the UFC when he debuted at 19, winning his first fight over Francisco Trevino via TKO inside a minute. He showed just how raw he was with two early losses (both submissions), but he’d beaten Michel Quinones, Thibault Gauti and Zak Ottow in his past three fights, to build a 6-2 UFC record and 11-2 overall in MMA. As with many things in sport, especially the fight game, it may have come down to money; that Northcutt was being paid above his value, still wanted more, and White decided enough was enough. From the outset, Northcutt’s pay scale angered his fellow fighters. His pay was undisclosed for his first fight, but after his second (a Round 2 submission win over Cody Pfister) it was revealed to be $80,000; $40,000 to show, $40,000 win bonus. It was more than the main event winner, women’s strawweight Rose Namajunas ($54,000 in $27k/$27k split), who has since become a UFC champion. Incidentally, Namajunas’ defeated opponent – Paige VanZant, the Barbie to Northcutt’s Ken – also earned $40,000 just to show up. Northcutt had already raised eyebrows by making his debut on a numbered pay-per-view event, in the prelims of UFC 192, and his salary did not go down well. It only got worse for his envious detractors. Per reported salaries, his pay appeared to increase $10,000 for both show and win each time he was victorious; meaning he banked $100,000 to beat Enrique Marin, $120,000 to beat Quinones, $140,000 to beat Gauti and $160,000 to beat Ottow, plus Reebok sponsor payments. He also got paid well to lose; $60,000 for his last defeat, against Mickey Gall, who got just $40,000 in a $20k/$20k split. While it wasn’t enormous money, it was far beyond what Northcutt had earned, while he also got plum opportunities like fighting at UFC 200, a milestone event touted by White as the biggest card in history. His $100,000 payday for beating Marin at UFC 200 was the same as Amanda Nunes got for beating Miesha Tate in the main event to claim the women’s bantamweight title, which she’s since defended three times. Northcutt was discovered on White’s own reality series, Dana White Lookin’ For A Fight, at an MMA event down in Louisiana. White had seen a picture of the then 19-year-old done up like a bodybuilder, making fun of his fake tan, spiked hair and glistening white teeth. Then he watched him pound and submit his opponent, Gage Duhon, for an impressive Round 1 win; capped off with a trademark backflip. “Holy s***! Holy s***! … I’ve been making fun of him. I ain’t making fun of him now,” White said. Before that, Northcutt had an extraordinary childhood. He began martial arts training at age four. At age five, his father Mark had him doing 250 push-ups and sit-ups a day. By age six, he was up to 1,000 of each per day. At nine years-old, he was the youngest person to ever feature on the cover of Karate Sport Magazine. He became an extraordinary karate exponent, winning 77 world youth championships, while he also has an undefeated 15-0 kickboxing record. He also had one acting credit as a child, appearing in Disney series Moises Rules! – starring Hannah Montana actor Moises Arias. 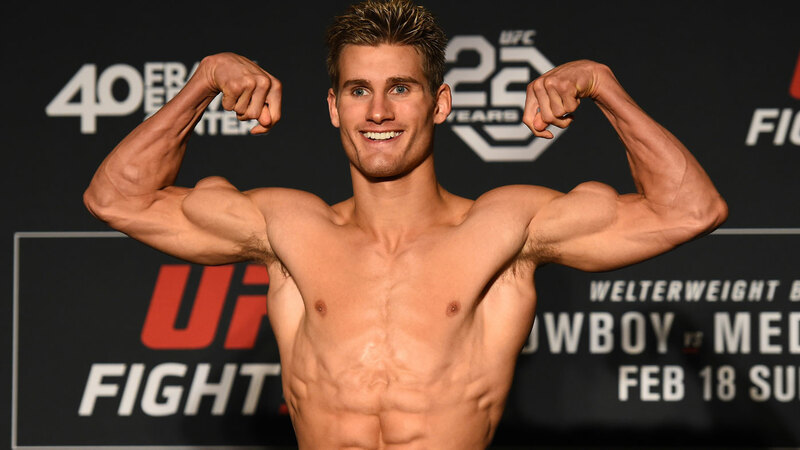 On top of that Northcutt is a devout Christian, studied petroleum engineering at Texas A&M University, and has literally never eaten junk food; as his incredibly ripped body suggests. He trains for three to five hours every day. Northcutt’s 5-0 pro MMA record before reaching the UFC was against dubious competition, to put it politely; his opponents had a combined record of 29-46. Though his introduction to the UFC brought a couple of stumbles, he seemed destined for a White-engineered path to stardom. White and Northcutt are yet to reveal precisely what went wrong. Northcutt has not spoken about his release. He appeared to be an improving prospect who had become a genuine UFC-calibre fighter, with plenty of upside remaining. Whether he ever makes it back to the UFC, time will tell. Surely rival promotion Bellator will be interested. Given he’s always been dubbed “too pretty to fight”, Northcutt is sure to have other career options.